This project outline is frozen (except for the membership list at the top) in the form it had on 17 February 2006 while we reorganize the research section as we begin work in specific areas. A new version will be posted in March or April. The Tompkins County Relocalization Project is an initiative of residents of Tompkins County, New York. It is not an activity of County government but rather a citizens’ effort to prepare a plan for eventual submission to County government. This document is intended to interest a few researchers in a project to create an emergency relocalization plan for Tompkins County, New York. The Editor, who has experience in the development of collaborative large-scale research and publication efforts, proposes to lead the volunteer participants in an initiative named the Tompkins County Relocalization Project. The purpose of the Project is to research and document an emergency plan for relocalizing the production and distribution of essential goods and services in Tompkins County in response to an economic crisis precipitated by an irreversible, perpetually increasing rise in the price of oil, a crisis that now appears to many of us to be inevitable and not much longer in coming. A basic assumption of the Project is that the County, like other governmental bodies and the American people generally, will not be willing to undertake costly measures to deal with the problems caused by the end of cheap oil until an emergency economic situation is already upon us. In other words, the TCRP does not assume that any of the sensible measures that could now be taken to ameliorate the coming crisis will, in fact, be implemented, but rather acknowledges that we will probably arrive at the day of reckoning unprepared and looking for a plan. The purpose of the Project is to be able to produce that plan without further delay. Perhaps the reader remembering recent events can compare this to preparations for a hurricane; prevention of the hurricane is not within the scope of the plan to deal with it. Another basic assumption of this paper is that the reader is already familiar with most facts of the current situation and just needs a quick overview of the direction adopted here to set the stage for the work ahead, which begins with the outline of research questions in Section 2. Therefore no attempt has been made in this paper to cite specific sources. All that’s intended here is a fair summary, not an authoritative reference. Properly annotating an introduction for the TCRP itself is considered a task for the Project. Readers skeptical of any of the assertions made in this overview are strongly urged to follow up with the sources cited at the end of Section 1. The phrase “peak oil” refers to the point at which the rate of worldwide oil production begins to decrease. Many independent petroleum experts predict that we will reach this point by the end of the decade — perhaps as soon as 2007. This doesn’t mean that we’re about to run out of oil. But it does mean that we’re about to run out of cheap oil — an event with enormous consequences to our way of living that could prove catastrophic if measures are not taken at the local level to prepare for them. Most thinking people already know two essential facts about oil: first, that there is a finite amount of it, and second, that we’re using it up. But most of them don’t understand how oil depletion actually works. They look at the “known reserves,” estimate the current rate of consumption, divide one number by the other, and get the usual answer: about 40 years before the oil runs out. In fact, consumption is not constant, and if conservative estimates of demand growth are figured in, the real number would be closer to 25 years. Fortunately — at least for anyone under the age of 50 — this is not what’s actually going to happen. Oil is not something that comes out of the ground at a constant rate till one day it’s suddenly gone, like gas running out from a gas tank. It’s more like a sponge full of water. Getting the first bit of water out requires only very slight pressure. Then you have to squeeze harder and harder to keep up the flow. Finally, you give up, but there’s still plenty of moisture left in the sponge. At the worldwide level, we’re at the point where we’ve gotten about half of the “water” out of the sponge — about one trillion barrels out of a worldwide total of two trillion that will ever be in existence. That first half was the easy part, and what we got was the best stuff. From here on, it’s going to get harder and harder to extract usable oil — or to put it in economic terms, more and more expensive. In physical (as opposed to economic) terms, oil depletion can best be understood in terms of something called EROEI — Energy Return On Energy Invested. For something to be a source of energy, you have to get more energy out of it than it took to obtain it. (This is why, contrary to popular belief, hydrogen is in practice not a source of energy; it always takes more energy to obtain hydrogen than you can ever get out of it.) Oil used to have an EROEI of about 30; that is, the energy of one barrel of oil was sufficient to extract, refine, and distribute the energy of 30 barrels of oil. That ratio is now down to about 4, and falling. Eventually we’ll reach the point where it will take more energy to get the oil out of the ground (and refined and transported) than the energy we actually get out of the oil. At that point, oil will cease to be a source of energy. There will still be plenty left from which to make chemicals and plastics, but it will be enormously expensive. Economically, what’s going to happen as we pass the peak and start down the backside of the petroleum production curve is that the supply of this essential commodity is going to start decreasing at a rate estimated at two to four percent or more a year at the same time that worldwide demand driven by China and India is increasing at about the same rate. 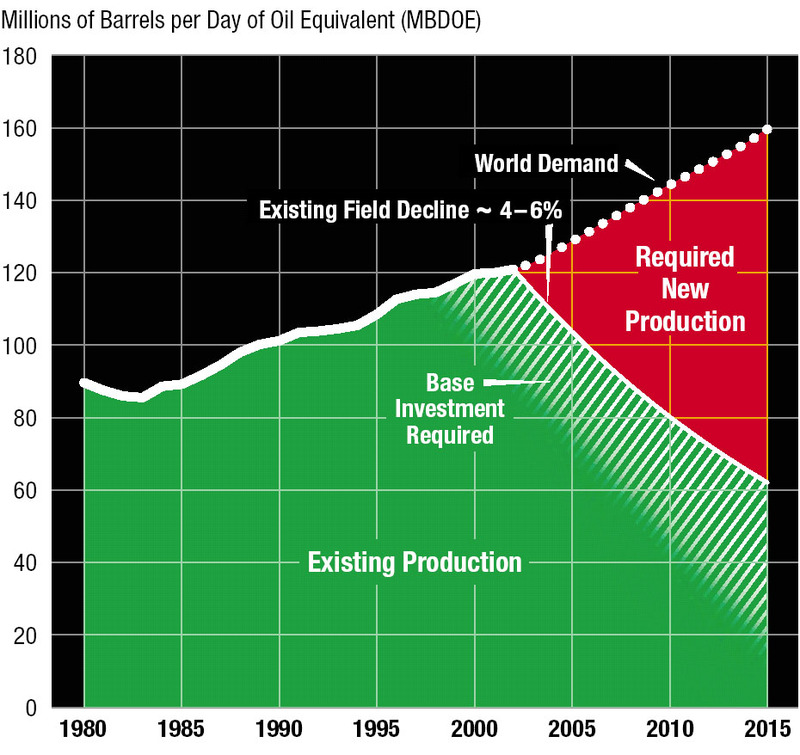 The following chart from a recent ExxonMobil report illustrates the resulting gap. Note that most of the huge shortfall labeled “required new production” cannot be supplied in reality from any source of oil currently known or likely to be discovered. ExxonMobil and the other big oil companies are well aware of this, which is why they spend less each year in the attempt to look for more oil even though oil prices have been rising for a while now. Until recently, the subject of peak oil had been of concern to just a handful of petroleum experts, most of them retired from high-level oil industry positions. Our leaders — even those with oil industry experience who can hardly fail to have realized that this problem would soon be upon us — have almost unanimously lacked the courage to deal with or even acknowledge the physical cause of our oil problems, choosing instead to treat them as economic ephemera. In 2004, however, an out-of-control oil market brought peak oil to the attention of an increasingly concerned group of industry analysts and press. In response, the U.S. Department of Energy commissioned a study of peak oil that was carried out by Science Applications International Corporation (SAIC), a 43,000-employee Fortune 500 company specializing in engineering and scientific analyses for the U.S. military and other government agencies. The SAIC study (also known as the Hirsch study after its principal author) was released in February 2005 with the title Peaking of World Oil Production: Impacts, Mitigation, & Risk Management. This report for the DOE is by far the most credible current mainstream assessment of the problem of peak oil. Scenario I assumes that action is not initiated until peaking occurs. Scenario II assumes that action is initiated 10 years before peaking. Scenario III assumes that action is initiated 20 years before peaking. By “action,” the authors of the Hirsch study mean “crash programs,” that is, nationally mobilized all-out emergency efforts on the scale of American manufacturing projects in World War II. The analysis concludes that the U.S. would escape significant economic and material disruption only in Scenario III, where heroic measures were undertaken at least 20 years in advance of the production peak. Anything short of this will mean a significant shortfall between supply and demand, a shortfall lasting for many years. Estimating the timing of the production peak is extremely difficult because much of the actual data is secret, and the estimates that are available are often demonstrably inflated. Furthermore, peaks of production are never evident until some time has passed and it’s clear that the trend is irreversibly downhill. After all, the point at which the peak occurs is by definition the point at which things have gotten as good for us materially as they can possibly ever be, so this is exactly the point at which it appears that we have the least to worry about. Some researchers believe that the peak has already arrived, but the experts who have spent the most time sifting through the available data put the peak of world fossil fuel production somewhere around 2010. A much rougher but more easily understandable way to estimate the peak is to look at discovery data. It is obvious that oil must be discovered before it can be extracted, so in general, the peak of oil production (averaged over a large number of reservoirs in a given region) will echo the peak of discovery; that is, due to the long period of time it takes to reach maximum production in any given region, you will get a peak of discoveries (averaged over a large number of sites) followed many years later by a peak in average production. This pattern was conclusively demonstrated in the United States “lower 48,” where discovery over a very large and diverse area peaked in the mid-1930s and production peaked in 1970. So it’s reasonable to expect a lag somewhere in the neighborhood of three and a half to four decades between the peak of oil discovery over a large and well-explored region and the peak of oil extraction over that region. If this lesson is applied to the whole world as a region, then the overall picture becomes very clear. 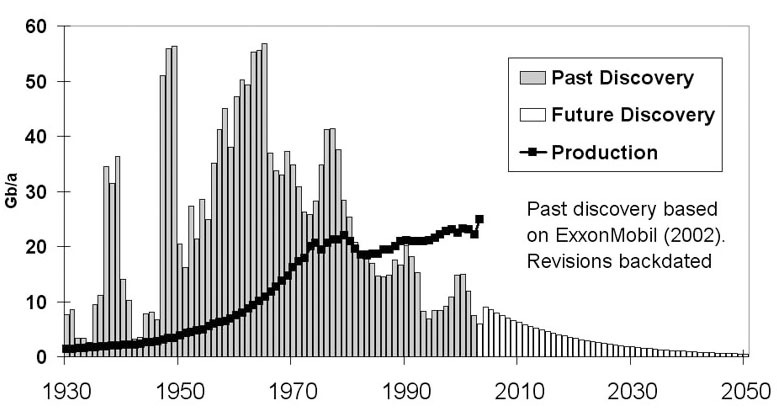 World oil discoveries peaked in the mid-1960s and have been declining ever since. According to ExxonMobil, 1987 was the last year that we discovered more oil worldwide than we burned. In recent years, we have been extracting about four barrels of oil for every new barrel we discover, despite the fact that we have by now mapped everywhere on the earth’s surface where there could possibly be any previously untapped large reservoirs of oil that could be extracted easily enough to provide a net energy gain. From the U.S. experience, we can reasonably predict the arrival of peak of world oil production to occur right about now. In fact, it’s quite possible that we would have passed the peak of production in the 1990s if we had not sharply decreased oil consumption for a few years in the wake of the 1973 OPEC oil embargo. If the peak does arrive between now and 2010, as many researchers are now predicting and as anyone would predict from the discovery curve, then there cannot possibly be time for Hirsch report scenarios II and III, which assume heroic efforts on a nationally mobilized scale beginning 10 or 20 years prior to the peak. As a nation, we are far from able to confront this problem in a timely way. On the contrary, we are deep in denial and willing to allow an incompetent leadership to attempt unsuccessfully to deal with the problem through military conquest. It seems certain that we will not undertake anything like the drastic, concerted measures posited by the Hirsch study until the economic outcomes of the peak are already upon us. In other words, it is highly likely that we will be acting out the study’s Scenario I, where major efforts to correct the problem are not undertaken until the peak actually arrives. 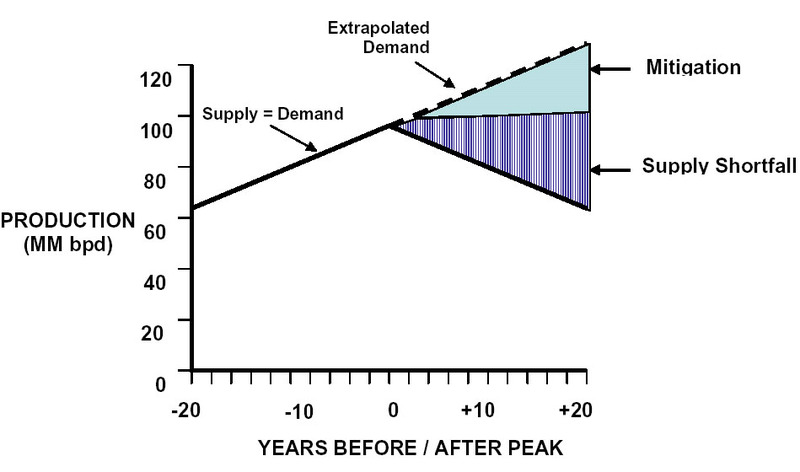 The Hirsch analysis for Scenario I shows roughly a 30 percent gap between supply and demand 10 years after the peak, leaving the world “with a significant liquid fuel deficit for more than two decades” — representing the delay in regaining equilibrium due to the astoundingly high cost and long implementation time of all the possible solutions. Increasing vehicle fuel efficiency, for example, generally considered one of the most effective remedies, must cope with the fact that the current U.S. vehicle stock is worth nearly two trillion dollars and normally requires 25-30 years to replace. The same is true of other large-scale “mitigations,” such as the creation of liquid fuel from coal and the extraction of oil from bitumen (so-called “oil sands”). The Hirsch study takes the extremely optimistic view that the overwhelming infrastructure replacements seen as required to get us out of the supply/demand hole are actually possible to achieve, given an ever-decreasing supply of the energy needed to accomplish these tasks. Many analysts are a great deal more pessimistic about our ability to replace large portions of our energy infrastructure with the resources we’ve got left. (See sources cited at the end of Section 1 for more on this.) It is possible that major improvements in the burning of coal and a total redesign of our current crude-oil based system, probably supported in the interim with large amounts of new nuclear power, can move us to a system based on natural gas and liquid fuel produced from coal, a system that could in theory keep us going for another century. This is the hope. But the Hirsch study demonstrates that we cannot achieve even this best case without first enduring a very unpleasant few decades, beginning probably in about five years. As world oil peaking is approached and demand for conventional oil begins to exceed supply, oil prices will rise steeply. [...] Another likely signal is substantially increased oil price volatility. Oil prices have traditionally been volatile. Causes include political events, weather, labor strikes, infrastructure problems, and fears of terrorism. In an era where supply was adequate to meet demand and where there was excess production capacity in OPEC, those effects were relatively short-lived. However, as world oil peaking is approached, excess production capacity by definition will disappear, so that even minor supply disruptions will cause increased price volatility as traders, speculators, and other market participants react to supply/demand events. Simultaneously, oil storage inventories are likely to decrease, further eroding security of supply, aggravating price volatility, and further stimulating speculation. While it is recognized that high oil prices will have adverse effects, the effects of increased price volatility may not be sufficiently appreciated. Higher oil price volatility can lead to reduction in investment in other parts of the economy, leading in turn to a long-term reduction in supply of various goods, higher prices, and further reduced macroeconomic activity. Increasing volatility has the potential to increase both economic disruption and transaction costs for both consumers and producers, adding to inflation and reducing economic growth rates. From recent “signals” (as the report puts it), it’s clear that this period of instability just prior to the peak has already begun. There is general agreement that declining world oil production will devastate the U.S. economy, which is based on endless growth fueled by endless infusions of cheap energy. As the Hirsch study points out, “Oil price increases have preceded most U.S. recessions since 1969, and virtually every serious oil price shock was followed by a recession.” Typically these recessions have set in a year or so after the price spike. In this case, however, the market will not be experiencing a momentary price bump but rather an endlessly increasing rise in prices, with economic consequences that could be exceedingly grim. It goes almost without saying that all residents of Tompkins County should be doing everything they personally can to live sustainable lifestyles to the best of their ability. Most people who live here already know perfectly well what they should be doing, and most would probably admit that they are not doing nearly enough. The efforts of local initiatives to build sustainability are essential to preparing us as best we can before disaster strikes; what we can do now locally, we certainly should be doing locally. But a realistic assessment of the future demands that we confront the likelihood that people will not willingly lower their levels of consumption until the crisis is upon us. This project attempts to think through the measures that we will then need to put in place in order to survive here economically while other localities think through the measures that they should take to best address their own local circumstances. Every location will bring its own set of strengths and weaknesses to its struggle with the economic, social, and material consequences of the end of cheap oil. So unlike most sustainability plans, which apply now and apply almost universally to the U.S. and other developed countries, this project aims to develop a plan that will apply in the near future and will address the specific strengths and weaknesses of Tompkins County. This kind of plan is called “county relocalization.” It is based on the belief that the size of counties and the traditional land use, welfare, and emergency management functions of counties puts them at the organizational level most appropriate to the management of emergency relocalization. In our case, it allows the plan to recognize and make best use of the unique blend of rural, town, and university resources in Tompkins County. The general outline of the TCRP may be applicable to other counties as well, but the objective is to map out in detail the measures to be taken right here. The Hirsch report has given us an excellent outline of the problems facing us over the 10 or 20 years following the peak of oil production, an outline with which most other analysts would agree. Beyond the first decade, however, some independent analysts project futures much bleaker than the eventual very painful recovery posited by the SAIC analysts. (See sources at the end of Section 1 for details.) Thus it will be useful for planning purposes to divide the future into two periods, the first consisting of the decade or so following the peak (that is, roughly, 2010 to 2020) and the second period including everything beyond that. This division is purely pragmatic for purposes of creating a short-term plan with a minimum of wasted effort by focusing on that part of the future that seems fairly certain and leaving for later the planning for a long-term future about which experts still disagree. The TCRP will therefore address in detail only the first phase, which for planning purposes will be assumed to begin by 2010 and will cover only the consequences that become obvious in the decade following the peak of oil production. Motor vehicles, aircraft, trains, and ships simply have no ready alternative to liquid fuels. Non-hydrocarbon-based energy sources, such as solar, wind, photovoltaics, nuclear power, geothermal, fusion, etc. produce electricity, not liquid fuels, so their widespread use in transportation is at best decades away. Accordingly, mitigation of declining world oil production must be narrowly focused. The big problem here is the knock-on effect of high costs of transportation. Almost everything we use and eat is transported long distances by truck or train, both of which depend on plentiful supplies of cheap diesel fuel. As transportation costs increase, the price of almost everything else will begin to increase in direct proportion to how far it has had to be transported. Thus the availability of goods and services and hence the ability of ordinary people to buy them will be directly related to the amount of goods and services that are locally produced. Transportation is of course an especially serious problem in rural environments such as Tompkins County, and our need to keep burning gasoline almost regardless of the cost is going to substantially worsen our struggle to get by while trying to cope with the rising costs of almost everything else. Not emphasized in the Hirsch report is the equally large problem of natural gas depletion. U.S. natural gas production peaked in 1973, and we’re depending now on imports from Canada as guaranteed by NAFTA to get by. But natural gas production is in decline in Canada, too. As gas becomes harder to get, the price will rise. In order to meet increasing demand, the EIA (U.S. Energy Information Agency) predicts a sharp increase in both unconventional domestic production and overseas imports in the form of LNG (liquefied natural gas). According to the Center for Liquefied Natural Gas, even with all potential sources combined we must include conservation and efficiency measures in our projections in order to match supply to demand. The EIA’s projected average price increases are modest, but recent history demonstrates dramatic price spiking, especially in the winter when the natural gas demand peaks. These sudden price increases are caused by unpredictable industry events — such as sharp declines in field productivity — combined with the fact that we no longer have significant excess capacity or storage reserves to buffer us against those events. It’s interesting to apply the concept of “relocalization” to the natural gas problem. We are currently undergoing a transition from primarily local (continental) production to increased reliance on global imports, so shipping costs are becoming increasingly significant. However, these costs are not dominated by oil prices. The primary costs include the need for a specialized LNG (liquefied natural gas) shipping fleet with pressurized storage tanks, the need for new ports and processing facilities to convert the liquefied natural gas back to gaseous form, and the safety and security issues inherent in transporting large volumes of pressurized flammable material. This year the need for port facilities is dominating the price picture. Natural gas prices are expected to rise more than 40 percent this winter as a result of port damage caused by hurricanes Katrina and Rita. This is of interest because global warming models all predict an increase in the severity of tropical storms and hurricanes as the ocean warms. According to a recent article in Science, the number of category 4 and 5 hurricanes has almost doubled since the 1970s, and they now represent 35 percent of the total number of hurricanes. There’s no way to predict when a major hurricane will develop or whether it will hit crucial port facilities, but we are clearly vulnerable to supply disruptions in the aftermath of such an event. That vulnerability will increase as our natural gas supply moves increasingly overseas over the next few years. All signs, therefore, point to steadily increasing price of natural gas punctuated by disruptive spikes, and (as in the SAIC analysis of oil depletion) we won’t see hoped-for alternative sources come online to meet the demand any time soon. It will be decades before LNG transported by a fleet of specially-built ships (LNG is an extraordinarily dangerous form of fossil fuel) and processed by a brand new set of LNG facilities can actually replace the declining output of North American natural gas, and the U.S. will not be the first country to get the future LNG output from the big overseas sources such as Qatar — easier-to-supply European customers are already in line ahead of us. The future demand for conversion of natural gas to gasoline — one of the heroic “mitigations” of the coming gasoline shortage identified in the Hirsch report — will put a further upward push on natural gas prices. The rising cost of natural gas will have a major impact in our area, felt both in the cost of heating (52 percent of Tompkins County homes are heated with natural gas) and the cost of electricity (38 percent of NYSEG’s electricity supply comes from natural gas). These problems will have to be solved if we’re to continue living here — but they’re not the biggest problem facing us. The simultaneous increase in both oil prices and natural gas prices over the coming 10-15 years will give a one-two punch to agricultural productivity, which is based on mechanized cultivation and harvesting and is fed by synthetic fertilizer. Mechanized processing is almost entirely fueled by diesel oil, and 95 percent of nitrogen fertilizer is made from natural gas. Thus a rise in fossil fuel prices is reflected directly in the cost of food. Another factor of critical importance for agriculture is the change in weather patterns that virtually all authorities now recognize as inevitable. While some may still argue over the causes, there is very little doubt that the climate is indeed changing, and it appears to be heading in the direction of wetter winters, drier summers, and an overall reduction in the amount of available water, amounting in some regions to a general drought. A reduction in the availability of water means even further reductions in agricultural output. The net effect of drought, a decreasing supply of fuel for mechanized production, a decreasing amount of chemical fertilizer, and an increasing cost of transportation will be to make all food much more expensive and to make food transported from any distance a very great deal more expensive, probably beyond the reach of many people. This steep rise in food prices will create changes in eating habits, and in our area it could lead to winter food shortages if measures are not taken to grow and store winter crops locally. According to the Hirsch report, the possible economic effects of a rise in oil prices include “dramatic increases in inflation, long-term recession, high unemployment, and declining living standards” as well as major shifts of the remaining workforce away from sectors dependent on liquid fuels. Some researchers believe that we may be seeing the end of the interest-based financial system itself, which is predicated on the seemingly perpetual growth in productivity we have experienced during the last two centuries of fossil fuel exploitation. Without going that far, it’s easy to find mainstream economists who believe that the U.S. economy is teetering on the edge of collapse simply because of its trade deficit with other countries, completely independent of what’s happening with the cost of oil. It’s been noted recently, for example, that the amount the U.S. owes China is equal to twice the total U.S. annual agricultural output, which may make for a lot of hardship on both sides when the Chinese begin bidding against us for our own food. An economy in as fragile a condition as ours is won’t need much of a push to knock it over. The least we can expect from rising costs of fossil fuel is massive unemployment. Dealing with unemployment will be a county problem, as it historically was in the past. To sum up, the most important challenges that will face Tompkins County beginning probably around the end of this decade include the maintenance of personal transportation, heating, food production, and food distribution in an environment of rising unemployment and a rising cost of living driven by rising costs of oil and natural gas. The key to answering these challenges is the local production of goods and services, including food, and the local production of electricity from renewable sources. The process of developing the ability of a region to provide its own goods, services, and energy is what is meant by relocalization. While one of these challenges — heating — presents a particular problem for central New York compared to some other regions of the country, Tompkins County possesses a number of major relocalization assets. A highly diverse and educated work force, magnificent academic and scientific resources, relatively abundant water and potential hydropower, working farms and much land capable of being returned to agricultural use, some timber, some natural gas, and perhaps most importantly, a culture of cooperation and tolerance, all put Tompkins County in a much better position to deal successfully with the coming difficulties than many other regions of the country. The outcome for us will depend on how well me make use of those assets when external energy inputs begin to decline. The purpose of this project is to identify, research, and analyze in detail the strategies for doing this, as outlined in the next section. Everyone interested in contributing to this project is urged to read at least the following four books. Heinberg, Richard. The Party’s Over: Oil, War and the Fate of Industrial Societies. New Society Publishers, 2003. Heinberg, Richard. Powerdown: Options and Actions for a Post-Carbon World. New Society Publishers, 2004. Kunstler, James Howard. The Long Emergency: Surviving the End of the Oil Age, Climate Change, and Other Converging Catastrophes of the Twenty-first Century. Atlantic Monthly Press, 2005. Odum, Howard T. and Elisabeth C. A Prosperous Way Down: Principles and Policies. University Press of Colorado, 2001. Creating the Tompkins County Relocalization Plan will require much further research and analysis. The rest of this project document lists what appear to be key areas of inquiry and outlines some of the questions that need to be answered in order to specify each part of the plan. Qualified researchers (preferably subject matter experts) are invited to take responsibility for each of these areas. While it’s clear that the two big economic challenges of the next decade will be prices and unemployment, it should be noted in what follows that the actual balance between prices and unemployment will depend on economic variables that are hard to predict. The price of oil depends on demand. When unemployment resulting from a damaged economy reaches the point where people’s consumption is substantially reduced, prices will come down again. At that point, we won’t be experiencing a shortage of oil, but rather a collective inability to pay for it. From an energy standpoint, these add up to the same thing: most of us will be doing without a great deal of the energy we’re in the habit of using now, and the immediate effect of this reduction in energy consumption will be a decline in our collective standard of living. This is a thermodynamic consequence of the kind of life we’re living. The exact mix of rising prices and unemployment we end up with is of secondary importance to the totality of their impact, and indeed it can be seen that the solutions we need to implement are basically the same for either. For simplicity in the following, the peak oil problem is generally cast as one of high prices, but in reality it may take the form of no money. Note that many observers predict hyperinflation as a possible outcome of a collapse of the petrodollar; hyperinflation is generally viewed as a rise in prices, but it can equally be viewed as a shortage of money, because everyone’s income is worth less. The Relocalization Plan assumes that gasoline and diesel fuel continue in the short term to be freely available, but very expensive. Under these conditions, affluent people are going to buy downsized hybrids and the rest of us will probably have to fall back on public transportation as the most energy efficient (that is, least expensive) way to get from point A to point B — or somewhere within a long walk of point B. Tompkins County is fortunate to have a relatively healthy bus system, but like virtually all American bus systems, it primarily serves the poor (including students), the disabled, and the elderly, and it serves them relatively badly compared to systems in places such as Amsterdam and Hong Kong where public transit is the way most people get around. To serve as a replacement for cars for most people in the County, including people in the more rural parts of the County, TCAT service will need to be greatly expanded in both geographic reach and hours of operation. The question is how to do this. As Kunstler and others have pointed out, school buses constitute a seriously underutilized parallel transportation system. Any investigation into expanding public transit should look at what we already have available. Efficiency. What is the actual energy advantage of a bus full of people over that of many people driving cars occupied individually (note that the energy invested in producing the cars and buses has to be factored in)? What is its actual advantage of a bus full of people over transporting those same people in fully occupied cars? Might it be better to constitute the expanded public transportation fleet the way it was done in Cuba, by using private cars operated by licensed drivers? Would our far harsher climate require a level of maintenance that would have to be provided by a central facility? Bicycles. Some of us believe that people can be persuaded to ride bicycles, even in this climate. Given the fact that people everywhere strongly prefer any kind of motorized transportation over bicycles when given the choice, does it make sense to plan on convincing people to switch to bicycles as a way to avert an oil crisis, or should we rather view bicycles as a means of transportation that many people will eventually adopt simply because they have finally run out of oil altogether, and prepare for this by making sure that most people have one? What role could the existing RIBS (Recycle Ithaca’s Bicycles) program play in achieving this goal? Designing expanded service. Who has the figures on traffic patterns of local roads on the basis of which the expanded system will be designed — NYDOT? Who will design the system? Finances. How expensive will the solution be? In other words, how will we raise the money to implement the solution, and what will it cost per ride? (Answering these questions will depend to a large extent on the design of the expanded system.) Who will need subsidies from the rest of us to be able to use the more expensive system? (Probably the people who are presently its primary users.) How will we fund those subsidies? Use of the school bus system. Our school buses already cover the County in the morning and afternoon; would allowing the public to ride along on existing runs allow people to commute to the jobs that are left? What about running the school buses all day and adding routes outside of regular school bus runs using the already trained drivers and maintenance system? Other existing resources. Could Gadabout’s system of volunteer drivers be expanded to provide additional public transportation? What about corporate van fleets converted to minibuses? Increasing density. To what extent can we solve the transportation problem by encouraging people to settle closer together? How can we foster increased population density in the city and cohousing projects in the countryside to gain maximum energy efficiency? Road and bridge maintenance. Road building and maintenance are both energy and petroleum intensive. At what point does maintenance of the entire network become too costly? What expectations should users have of road quality on arterial roads, side roads, and neighborhood roads? Do expectations of lower quality change the choices of vehicles that can run on the roads, especially for trucks and buses? How will energy costs affect winter road plowing? Bridges are especially troublesome, as they can break the road network completely. Are there approaches that can be used to strengthen bridges and lower their cost of maintenance? While it seems likely that emergency service providers, including police, fire, and ambulance will have the highest priority on fuel, each of these areas will have its own new stresses to deal with. All of them will be operating in a very different environment from the present one, facing issues from fewer paved roads (oil prices drive asphalt prices) to greater chaos and need and changes in expectations. Police. Periods of social dislocation tend to create more property-oriented crime, though perhaps these same circumstances may make some kinds of crime (notably drug-related crime, where the drugs have their own transport issues) less common. Will the number of police generally need to increase? Will urban police need to shift back toward walking a beat? How will rural policing shift? Will state prison facilities remain as available as they are now? Fire protection. Fire trucks and other firefighting equipment are very specialized. Will parts remain available? How much will the cost of operating these vehicles increase? Will volunteer departments be able to operate given the added costs for volunteers getting to the station? Could bunkers (places for volunteers to live at the station) become more attractive and useful ways to attract volunteers? Will residents be able to expect the same level of coverage from departments? Ambulance and rescue. Will ambulances be able to operate as general-purpose medical transport, or will they be restricted to the most serious and/or immediate cases? Will medical equipment remain reliably available? Would it be more efficient to move people in greatest need of medical services into more concentrated facilities with nurses and doctors on site for much faster response? Volunteer rescue networks will face the same stresses as volunteer fire departments; how will they adapt? As the price of oil rises, the increasing cost of transportation will make local food production essential to maintaining a proper level of nutrition in the County, and the high cost of living will make it necessary for most people to grow a significant portion of their own food, just as they did before and during World War II. Thus a two-pronged approach is needed: one effort to encourage maximum utilization of our farmland and one to encourage every household in a position to do so to establish its own garden. Ordinances that hinder household food production in urban areas of the County will need to be revisited. The County will need to cut taxes on agricultural land, fund programs to train people in sustainable gardening, and encourage the formation of CSAs (community supported agriculture, that is, farm produce subscription programs) in order to create as much local agricultural production as the area can sustain as quickly as possible. The County may need to jumpstart partial self-sufficiency by providing plants and animals free to households, much as forestry programs provide seedlings for reforestation projects. If food prices rise more quickly than expected, a surge in demand for breeding poultry and small stock may quickly exhaust limited sources of supply, so programs to encourage local breeding programs may be advisable to maximize the availability of spare breeding stock in advance of demand. The unusual demographics of Tompkins County will pose special challenges to self-sufficiency. A large portion of the population moves every year; this is not conducive to home gardening. And much of the population consists of students, who are not here during most of the growing and harvest seasons. The County’s permanent residents will also face challenges in attempting self-sufficiency. There is little room for gardening in densely populated areas, and the soil isn’t the most productive for the types of food that could be grown by residents. The lovely small shaded lots seen in the City of Ithaca are not well situated for the sunlight needed in our short growing season. Many of the elderly and disabled won’t be able to maintain gardens. Most able-bodied residents have little experience in gardening and almost none in animal care. The introduction of livestock into urban areas could lead to outbreaks of diseases such as avian flu; many viruses are capable of migration between animal to human in such a setting. Commercial agriculture is subject to a level of regulation and record keeping that would be absent in the general population; livestock raised by a mass of untrained individuals could suffer outbreaks of disease that we have no way of tracking or treating. Even so, it’s difficult to envision a workable future that doesn’t encourage as much home gardening as possible, including a few chickens for every household, as was common almost everywhere fifty years ago. It is possible that the optimum answer given our demographics is to encourage denser populations (easier to heat, easier to transport, easier to supply with food, health care, and other services, including education and jobs) and encourage agriculture by providing subsidies (tax relief, housing, low-interest loans) to those who would grow the food to support the remainder of the community. Right now farmers are getting old and retiring. They would love to see the farms that their families have built for a century continue to be productive, but farming right now isn’t an attractive prospect for most young people. It is possible that incentives and income could bring enough farmers into the County to provide enough food for its residents and maybe some for export (more on that idea below). Access to heritage seeds. Hybridized and genetically modified seeds are highly regulated and expensive. It would be necessary to remove ourselves from that loop quickly. Facilities to store seeds for each year. Without a seed stock, which the average individual isn’t capable of maintaining, there’s no way to sustain production. Transport to the co-op gardens so that people are able to maintain them. Storage for the harvest at the community garden level. Root cellars or a canning facilty would be more practical at this location. Most apartment dwellers don’t have room to store a winter’s worth of food in their homes. Whether this model is appropriate for every community remains to be seen, but any viable solution will have to address the same points. The role of Cooperative Extension in providing gardening and livestock programs for households and training in sustainable practices for farmers will be critical to the creation of sufficient agricultural capacity to support the 100,000 residents of the County without dependence on inputs from other areas, which will be just as hard hit as we are. Knowing our limits. What is the carrying capacity of Tompkins County’s current agricultural base? What would the carrying capacity be if that base included all the farmland not currently in production and all the former farmland that has been taken out of production (bearing in mind that a share of the land taken out of production in the last century — the great depression state buy-outs that created Shindagin Hollow, Connecticut Hill, Hector National Forest, Michigan Hollow, etc. — was taken out because the land was hardscrabble and could not even be used for pasture)? What would the steady-state carrying capacity of the County’s existing and potential farmland be if the County were closed to outside inputs of cheap fertilizer and fuel? Urban farming. How can families living on the small, shaded lots typical of houses in Ithaca create productive gardens? What would be the optimum way to raise chickens on those plots if the present ordinance prohibiting the keeping of chickens were changed? Is it possible to grow fruit trees in town? If so, where? Would it make sense for the city to plant fruit trees? How could we ensure that those trees were provided with specialized pruning, knowledge of the diseases that afflict particular species, and water at critical times? At what point will the need of city dwellers for locally produced food overcome their aversion to the mess made by the fruit and flowers dropped by productive trees and the wildlife and bees they attract? How do zoning laws need to change in order to maximize the agricultural use of land in the County that is now considered to be residential? Sustainability. How much organic fertilizer (manure, compost) will be needed to keep gardens productive if the farms that can no longer afford synthetic fertilizer use up all of the organic sources for their own needs? How do we enable and encourage households to compost all their garbage and grass clippings, not as a trash abatement measure but rather as an essential component of a sustainable food system? At what point do we start encouraging the use of composting toilets? Nutrition. Which crops are needed to sustain local health (in terms of vitamins, for example)? How do we make sure that people have ready access to them? Aquaculture. Standing water is a seasonal problem in much of the county, and ponds are a common feature of the rural landscape. Can these resources be put to use for commercial aquaculture? How would aquaculture in this climate compare with livestock in terms of efficient conversion of vegetable biomass to protein? It’s obvious that our current system of “big box” retail merchandizing, wholly dependent on the car for customers and cheap supply chains for goods, is in for very hard times as fuel becomes more expensive. The most critical distribution problem, simply because it is the most essential, is going to be the distribution of food. Local production must be accompanied by local distribution in order to reduce the total distance between producer and consumer as far as possible. Tompkins County already enjoys the beginnings of a viable local food distribution system in its farmers’ markets, but a model of distribution in which everyone drives down to the Steamboat Landing or out to Trumansburg is not going to seem sensible as individual car trips become more expensive (or less money is available to pay for them). We need either to expand the system of local markets in order to reduce the average distance people have to travel to get to them or introduce ways to bring people in to the existing centers more cheaply by transporting them in groups. Either way, planning for this system is deeply intertwined with planning the expansion of public transportation. Getting a handle on the current system. How far do farmers travel now to the existing farmers’ markets? How many customers do those markets have? How far do they travel to get to the markets? How much bigger would the markets have to be in order to supply most of the food requirements of the current population? Designing an expanded system. What arrangement of local distribution centers would provide the maximum reduction of farmer/customer travel distance? Which is more efficient, increasing the number of distribution centers to reduce the distance traveled in cars or increasing the access to existing distribution centers via public transit? Would it help to establish a farmers’ market in each township? How does bringing food to households via weekly delivery from CSA programs compare in efficiency with any of the schemes in which consumers travel to a distribution center? Could we apply the “Empire Livestock” system in which one driver picks up the goods from each farmer and brings them to a central location? Engaging the private sector. We used to have an extensive network of local food distribution centers; they were called “grocery stores.” What can we do at the County level to encourage a market-driven re-establishment of local stores? Climate presents a special food problem for our region because many of the fruits and vegetables that are now available year-round from places like Peru and New Zealand will only be available for part of the year when we can no longer afford to have them flown in from halfway around the world. People will need help in learning how to plan meals around seasonal availability again. Two areas of special concern are the preservation and storage of food for the winter and the supply of fresh vegetables during the winter. Winter crops. Recent research has shown it possible to grow certain species of green vegetables well into the winter in places like Maine that have winters even worse than ours. What would be required to equip households with the garden structures needed to provide food for most of the year in Tompkins County? How could we give people incentives to deploy such structures far enough in advance to be functioning before a time of critical need? Preservation. What techniques are best suited to the conditions we will be facing after the peak? Does home canning make sense given the requirements for materials, equipment, training, and storage space? Freezing is the easiest way to preserve most foods, but at what point on the curve of rising electricity prices does it become uneconomical? Which foods can be preserved by drying? How well prepared are we to expand existing programs of education in canning and preservation techniques to embrace most households? How can we promote the creation of root cellars and train people in their maintenance and use? Individual self-sufficiency vs. collective action. Does it make sense to think in terms of household self-sufficiency in a population with a high proportion of single residents, or should we be thinking instead of individual contributions of labor to a system operated in common? Should we focus on providing individual households with the means to preserve food, or should we concentrate instead on a market-driven re-establishment of what was once an extensive local food processing industry? Emergency food distribution. At what point should the County begin to implement its own food preservation and storage systems? How much stored food would be needed to keep people alive in case of an unusually short growing season or a disastrous late frost, and how would the County get it to them? Diet and health. What is the role of the County health department in monitoring the nutritional status of County residents? How do we cope with health problems caused by nutritional deficiencies that haven’t been seen for decades? At what point does the County step in to commandeer and distribute foods essential for health to poorer households? If we start to get hungry, the current widespread abhorrence of hunting is probably going to change in a hurry. The fact is that this area is lousy with deer. The disappearance of all their predators has resulted in an explosion of rapacious freeloaders that brazenly wander town streets in broad daylight looking for another garden to devastate. The gross imbalance of our deer population precipitated by our killing off all the local predators is a game management problem that has to be dealt with anyway. It would be silly to ignore all that protein when people start facing winter food shortages. And certainly hunting for food is morally superior to the cruel and disgusting practices of current factory meat production. Capacity. About how much venison is estimated to be in the county right now? How much would there be if currently abandoned agricultural land were to start being actively farmed again? What is the optimum game population, that is, the one that will steadily support the maximum yield if hunted most effectively? Processing. It has to be assumed that people will start knocking down deer as soon as the price of meat hits a certain level. How are we to safely handle the resulting increase in meat processing? How many people will need to be trained for this task? How will we handle sanitation? Safety. The potential dangers of hunting are well known. What’s our capacity for training courses? Licensing. Does this change our licensing or other laws and ordinances relating to hunting in any way? Is it wise to retain the current prohibition against using a rifle? (Probably, for safety reasons.) Should hunting seasons be extended? Most current costs of health care are not directly related to oil, but a decrease in mobility due to increasing costs of transportation will certainly affect our ability to access health care. This is essentially a problem of distribution, and it raises questions similar to those listed for food distribution. If economic disruption results in high unemployment, then the ability of County residents to obtain essential medical care becomes a serious problem in itself. Distribution of services. Is it more efficient to increase TCAT service to transport people to existing medical centers, such as Cayuga Center and the Guthrie Center, or should we be looking to create a network of smaller clinics closer to outlying communities? Would it make sense to create a visiting physician program run by the County health department? Does the County have the necessary public health infrastructure to care for those who will require help? Should the County petition the state to change its licensing requirements to allow a shift of common medical procedures from physicians (MDs) to nurse practioners (NPs)? How many NPs can the County put into service? Would it make sense to return to former care models, such as the one common throughout the country after WWII in which home health was included in public health departments, so that direct care could be delivered through the County? How are services such as hospice care, epidemiological surveillance, and vaccinations presently managed in the County? Does the County effectively serve our population in these and other areas of healthcare delivery? What are the alternative healthcare services presently available to County residents? What mental health and social services presently exist in the County? Through which agencies do such services operate? Cost of services. How do we define "essential medical services"? Should the County create outpatient clinics for people unable to pay for essential medical services? To what degree are both conventional and alternative services paid for by private or public funds? What are the options for equalizing the distribution of health services in a strained social environment? Do we have examples available to us for modeling equitable care and, if so, can they be customized to meet County needs? Like health care, grammar school education can be seen as a problem of distribution, and it raises similar questions. Distribution of classrooms. Is it more efficient to maintain the current parallel system of school buses for children, or would it be better to combine all public transportation into one system? Is it more efficient to continue to bus students to existing schools, or should we be looking to create a network of smaller schools closer to outlying communities? Would it make sense to create visiting specialist education programs to teach topics such as music? Apprenticeship vs. classroom training. A general question both for education as such and with regard to issues of employment and training below is the balance between classroom education and apprenticeship. How can we revive the practices that in the past educated young people in skilled trades? How can we best direct individuals into modalities of education and training best suited to their aptitudes and the needs of the County? One almost certain outcome of a permanent increase in the price of oil will be a serious downturn in the economy resulting in large-scale unemployment. The most immediate needs of the unemployed are, of course, food and protection from the weather, so the most important issues associated with these needs are covered under the sections of the plan relating to food supply and heating. In this section we are concerned primarily with retraining as an integral part of relocalization. The most obvious area for retraining and new employment in Tompkins County is in agriculture, as the sizable expansion of local agricultural production required to keep us from going hungry will also require a sizable expansion of farm labor. Another area in which the County could develop economically is manufacturing, and this will require training as well. Research questions relating to agriculture (as a local industry) and manufacturing (as a local industry) are gathered under each of these subjects below. Beyond its role in meeting local needs, agriculture represents one of Tompkins County’s best bets as a local industry. Unusual as the County’s average level of education may be and as unused as many of its residents are to manual labor, the fact remains that Tompkins County is located deep within New York State’s agricultural heartland and is still potentially very productive. New York State was once a net exporter of food, capable of meeting both its own needs and the needs of its urban populations with some left over (though of course there were fewer people to feed back then). New York agriculture went into decline when cheap fuel made it less expensive to grow food thousands of miles away on land suited for factory farming than to grow it locally during our shorter growing season. When transportation becomes expensive again, New York city dwellers will return to importing their food from within the state. Tompkins County may derive considerable economic benefit from going beyond local self-sufficiency as outlined elsewhere in this plan and actually becoming a supplier of food to New York’s urban populations. And someone has to do it. It should cheer all of us facing a problematic future to reflect on our region’s native agricultural productivity. At the end of World War I, when most farming was still powered by horses and most fertilizer was still provided by manure, New York state had under cultivation nine million acres of wheat, 116,000 acres of barley, and the second largest acreage of sweet corn in the nation. It produced more potatoes — 32 million bushels a year in 1919 — than any other state in the country. Beans as a crop are actually native to New York; the first commercial bean crop on record was grown in 1836 in the Town of Yates, in Orleans County, and New York then had to teach the rest of the country how to eat them. 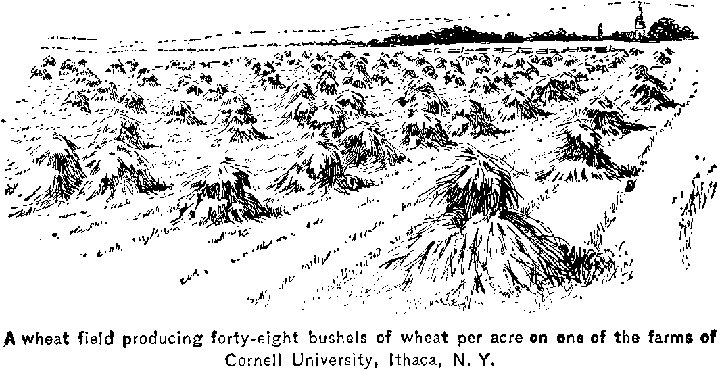 At the turn of the last century, fields of wheat at Cornell were yielding 48 bushels per acre. Certainly this is not as productive as an acre of dwarf wheat in Iowa doused with chemical fertilizer, but it is an excellent performance for fields in which this productivity can be sustained indefinitely. The tall wheat, which then grew as high as a man’s chest, also supplied the straw needed for bedding, composting, and many other uses. It’s true that we can’t produce oranges or cashews in Tompkins County, but we can certainly grow the kind of crops needed to sustain our population. The same climate that makes for good grains makes for good grasses, and Tompkins County has some excellent pasturage. In fact, the USDA used to classify western New York state as part of the U.S. “Hay and Pasture Region.” In 1919, New York produced more timothy and clover — almost four million tons — and more hay and forage — almost ten million tons — than any other state in the country. If supplemented during the winter with a grain such as barley grown separately during the summer, the raising of cattle, horses, sheep, and goats can be very successful here, as it is in many northern climates. And the conversion of grasses and grains into manure by livestock would provide an essential input to crop production elsewhere in the County. Livestock production should be supported and encouraged. We are fortunate to be home to a leading veterinary school at Cornell that can help us form this part of the plan. In addition to its potential agricultural productivity, Tompkins County is fortunate in having retained the two most economical forms of transportation needed to convey produce to distant markets — by rail and by water. We lost our passenger rail service years ago, but the infrastructure is still there to support freight carrying coal north to the power plant and salt south from local deposits. The same system could be used to transport produce from Tompkins County to cities located to the north and south of us. Transportation by water holds even more potential. Before we began to use cheap fossil fuel to power transportation (first with coal for the railroads), the least expensive way to transport goods across the state was by barge canal. As fossil fuel becomes increasingly expensive, the economic balance will swing back to transportation by canal again. Tompkins County enjoys the rare benefit of barge access all the way from the Ithaca inlet to the Great Lakes in the west, Albany in the east, and New York City to the south. In fact, it is possible to travel by water all the way from the steamboat landing at the Ithaca Farmers’ Market across the Great Lakes, out to the Ohio River, and down the Mississippi to the Gulf of Mexico. We should be thinking of ways to use this economic asset afforded by our location. Many agricultural products that do well in our cold, humid climate — wheat, barley, oats, rye, beans, potatoes, and cheese — travel well and should be looked to as potential export products as well as local sources of food. Not all economic opportunities will require export, however. A grain-based agricultural industry that will very likely become strongly local again is brewing. Beer doesn’t travel well anyway, and for many centuries it was as local a product as bread. The U.S. used to have thousands of breweries. If you wanted a beer a hundred years ago, you and your friends would send a boy and a nickel to fetch a bucket. The coming economics of expensive transportation are going to give local brewing a big competitive cost advantage. Fortunately for us, our locally brewed beer is potentially the equal of any in the country. New York used to be one of the top hops-growing regions in the country; in 1900 it produced more than 17 million pounds. That represents a lot of beer. Two local breweries — Ithaca Beer here in Tompkins County and Wagner Valley Brewing in Lodi — are reportedly already using locally grown hops. Wine, on the other hand, is a prime candidate for export. New York is the third largest wine producing state, and many wineries are in and adjacent to Tompkins County. The adjunct industries that support those wineries add even more to the economy. Since the most significant competition for NYS wine comes from places like California, Europe, and Australia, it’s clear that the competitiveness of local wine will benefit immensely from higher costs of transportation. It may not take much incentive to recreate a strong agricultural presence in Tompkins County. The majority of hay and corn grown in the County actually goes to feedlots out west, but if the price of food skyrockets due to transportation and other costs, and it’s once again possible to make a living by farming, the farms will return, and it might not take a long time for this to happen. New farms are starting all the time, but most go out within a year or two because the profit margin is currently too low to sustain a family. A change to the local tax structure could have a disproportionate positive impact on the number of local farms. Intelligently directed common action can shift the economic balance, too. Last year, for the first time in nearly 30 years, local farmers cooperated to grow enough green beans to attract a large processor to this area to buy and process the crop locally. Cooperatives such as the GLF used to play a pivotal role in the local farming economy; with organizational support from the County to encourage collective buying and selling (through cooperative venues such as the Greenstar Coop, for example), joint action could have an effect on local farm economics far beyond the investment of material and energy. Targeting. Which agricultural areas shall we particularly encourage? Candidates include wheat, barley, oats, rye, apples, pears, berries, walnuts, hazelnuts, and grapes; dairy farming and cheese making (a particular historical strength of central New York State); honey (already a Tompkins County export); small stock (sheep and goats); poultry (chickens and ducks); and horses. Pollination. Tompkins County is well provided with apiarists who sell quite a bit of honey, but a meaningful increase in the number of fruit trees will mean that more hives are needed for pollination (the range of a bee for this purpose is only about a hundred yards). We are blessed with the Cornell University Bee Lab, so the experts can tell us how many hives are needed for the agricultural developments we are planning and can map out a plan for training and equipping a few more beekeepers in the County. Aside from being an important source of income, a good supply of honey will be greatly appreciated as the price of refined sugar increases. Training. What training facilities (buildings and people) are available to accomplish the training and re-education called for in the plan to develop local agriculture? How many people ought we to aim to put back into farming (beyond the minimum needed to be agriculturally self-sufficient)? How many people would we need to hire in order to retrain this number of County residents? How much would this cost the County? What can Cornell contribute? What can TC3 contribute? Can retraining for new agricultural jobs be substituted for County jail time and thus reduce a significant County expense while preparing us for a rise in farm-related jobs? Subsidies. How can we best encourage the establishment of local farming? Should the County assist people in purchasing farm equipment and initial supplies? Should the County sponsor a loan program? Taxation. Could a change in the local tax structure for agriculture tip current farm economics far enough toward profitability to encourage the re-establishment of local farms in advance of market forces? Maximizing production. Tompkins County is home to one of the finest agricultural research and teaching facilities in the country. How can its attention be focused on research into practices tuned for sustainable agriculture given our precise climate and landforms? Does the research station still maintain two or three old local cultivars of each grain as controls? Which of these are most productive in Tompkins County? Packaging. Where will we get the materials to package the goods we produce for transport? What facilities will we need to restore the system of returnable (reusable) bottles we had fifty years ago? As replacements for appliances become more expensive to import, their repair will offer more opportunities for employment; we should be thinking about training programs in appliance and machine repair. The shift from “replace” to “repair” will cause an increased demand for repair parts, which will often have to be met by custom machining performed locally. Once the ability to manufacture parts is established, we may see a return to the local manufacture of durable goods, especially heavy items like stoves and refrigerators, and perhaps even the return of regional brands for these items like the ones that were found all over this country till the 1950s. Nineteenth century Tompkins County was a manufacturing powerhouse; it can become one again if the effort is properly planned and backed by local public incentive programs. In a world of ever increasing transportation costs, it will quickly become uneconomical to import tractors from Korea and washing machines from China. When that tipping point arrives, much economic opportunity — not as much as before, but a significant part of what’s left in the way of business — will flow to places where people have prepared for the demand for more locally manufactured heavy goods. Tompkins County’s history, location, and highly educated and intelligent workforce position it to be a provider of manufactured goods for this entire region. For the economical transportation of heavy household items ranging from washing machines to windmills, Ithaca’s water access to the Great Lakes and the canal system is a great asset. It may also prove essential to the transportation of heavy materials such as steel into the County. To jumpstart a local manufacturing capability that can take advantage of this opportunity we will need to foster the creation of tool shops (metal-working tools like lathes and mills and sheet-metal benders might be a good investment) and to teach the operation of these tools in our high schools and adult programs. It’s important to understand that this creation of manufacturing jobs will probably not be able to compensate for the loss of local jobs as the “big box” retailers lose their import advantages and finally collapse. Stores like Wal-Mart and Target and KMart owe their existence to goods that are cheap because their transportation has been subsidized by oil prices that in the future we will come to regard as practically free. It doesn’t take much of an increase in the price of transportation to take all of the wind out of the gross margins of these chains. They may be kept in business for a while by the fact that we don’t have a choice — for many of these goods there just are no American manufacturers any more. But eventually the much higher prices will catch up with sales, and that may be the end of them. Losses in the retail sector could throw more people out of work than we can expect to recover in manufacturing, which is why we have to be ready to support some of our neighbors and help them cope. But if we play our cards right, we can make getting through the downturn as a community a lot better than what we might experience otherwise. The collapse of the global big-box retailers will leave a vacuum in retailing that will be hard to fill. Over the last 50 years, just-in-time supply chain models based on unlimited cheap fuel have allowed centralized distribution systems to achieve fantastic economies of scale through the elimination of the traditional sales system, which had multiple layers of both salespeople and points of distribution. While eliminating much cost (by putting most of those people out of work), the resulting system is incapable of supporting localized systems of distribution. Encouraging local business is thus not a moral issue but rather one of economic survival. Unemployment. Which sectors of our local economy are most likely to be affected (positively or negatively) by high oil prices? What estimate can we give for the likely net increase in local unemployment resulting from these effects? Who is most likely to be unemployed? Sector targeting. What sectors of the local and regional economy will still experience meaningful demand despite high oil prices? What specific manufacturing areas should we specialize in — clocks? guns? windmills? washing machines? What are the opportunities for blacksmiths and farm equipment mechanics in a local economy turning back to agriculture? Availability of materials and essential components. Having established the target industries, how can we ensure that materials (e.g., metals) and components (e.g., ball and roller bearings) remain available? Bearings are a special case, as they are essential to the creation and maintenance of most machines that do any actual work, including motor vehicles, and there are relatively few manufacturers of bearings left in the northeastern U.S. What exactly is the health of those manufacturers, and where are their products actually made? Given the essential role of ball and roller bearings, should we try to manufacture our own? Training. What training facilities (buildings and people) are available to accomplish the training and re-education called for in a plan to develop target industries? How many people would we need to hire in order to retrain enough people to start working in the target industries? How much would this cost the County? How can our university and colleges help with this? Subsidies. How can we best encourage the establishment of local manufacturing? Should the County assist people in purchasing equipment and initial supplies? Should the County sponsor a loan program? What about tax breaks? Small business infrastructure. How can we maintain and encourage the regrowth of a viable local distribution, warehousing, and sales system for retail goods so that people have enough goods and enough choices without traveling relatively long distances to shop? What role can local currencies such as Ithaca Hours play in encouraging local sales and avoiding reliance on petrodollars? Saving its residents from freezing will be one of the most difficult problems facing the County as energy costs soar. A century of relatively cheap oil and natural gas has provided residents with little incentive to upgrade thousands of poorly insulated area homes. An aggressive retrofit program with goals backed by County enforcement and subsidies for low income households will be required to prevent extreme hardship as the price of oil and natural gas rises beyond the point where many can afford to heat their homes. As with other energy conservation measures, it is unreasonable to expect that new construction practices will have a significant impact on this problem. The existing base of older homes is too large and the time available is too short to replace any significant proportion the the existing housing stock with new construction. The focus must be on making our existing structures less expensive to heat. Quantifying the need. How many County residences have undergone an energy audit? How many are estimated to need retrofits? How can we require residents to take advantage of existing state subsidies for audits and repairs? Planning the solution. An expert group must be tasked with designing a program to ensure that area homes are sufficiently well insulated. Costing the solution. How much will it cost to bring older homes to a level of energy efficiency that will allow their tenants to afford to heat them in the future? How much of this cost can be borne by state programs? How much will need to come from the County? Enforcing the solution. What legal measures can the County take to compel compliance with the plan? Heating with biomass. What is the County’s sustainable output of firewood? How does this figure change if more land is returned to agriculture? How much wooded land can actually be returned to agriculture? (Certainly not all of it; much wooded land is on soil unsuited to crops.) How many homes are currently equipped to heat with wood? How many of them can be heated with wood given the estimate of sustainable output? Does the estimate change if the land is used for the production of switchgrass (or corn or Miscanthus) pellets instead? What would it take to set up facilities to pelletize perennial grasses for heating fuel? Geothermal heating. It’s long been recognized that substantial energy can be saved in our climate by converting gas- and oil-fueled heaters to geothermal heat pumps that draw on warmer underground temperatures during the winter. Can such systems be made affordable enough to offer a reasonable upgrade path for existing heating systems? Increasing population density. (See also related questions under “public transportation.”) High-density structures such as apartment buildings and cohousing communities are far more efficient to heat than single-family dwellings. How can we encourage people to live closer together in order to lower per capita fuel consumption? How much relocation to areas of higher density is actually achievable given increasing shortages of the energy needed to build more centralized housing? Alternative approaches. Can alternative insulation materials such as hay bales be used to cut heat loss from older homes cheaply? Are materials available that avoid the problems with mold, mildew, and rat infestation associated with hay as an insulator in this climate? Can windbreaks be used to moderate the effects of the weather? Can passive solar retrofits have a meaningful impact on the cost of heating older homes? What would be the most cost-effective design for passive solar retrofits given our typical building types and climate? Fallbacks to County facilities. How many people can be temporarily housed in County facilities during particularly cold weather if they can no longer afford to heat their homes? As the Hirsch report and other analyses make clear, alternative sources of electrical energy such as solar panels (photovoltaics), wind power, and hydropower cannot begin to alleviate the near-term transportation crisis, since our petroleum-based equipment will take decades to replace even if it’s assumed that we will have the means to do so. But the overall problem will be much worse if we’re also lacking affordable electricity. It’s hard to see how we can reestablish local industry, for example, without reestablishing its supply of power as well. Fortunately, we still have the basic energy source that powered the County’s manufacturing base two hundred years ago — falling water. The local history book Place Names of Tompkins County lists no fewer than 35 former sites of water-driven mills and factories in the County. Most of the waterways that provided that power are still there. Fifty years ago, before they were bought up by the large power companies, small local hydro plants supplied the local electricity needs of many communities in the Northeast. Tompkins County is in a particularly good position to reimplement local water power. Incentives. What federal, state, and local incentives currently exist that could be used to encourage County residents to install wind and solar power? What can the County do to aid people in discovering these incentives and negotiating the bureaucratic processes associated with them? What role can nonfinancial incentives such as community recognition programs play in rewarding people for investing in solar and wind power? Hydropower. Small-scale hydro generating systems (microhydro) are the cheapest and most reliable of all the sustainable sources of electrical energy. Where are the sites that formerly supplied water power to the County? How many could support a microhydro facility, and of what generating capacity? (This can easily be calculated from the height and volume of the water at a particular location.) What would it cost to construct those facilities? To what extent would the County need to exercise its power of eminent domain in securing the sites? What kind of local authority would be needed to implement and administer the program? What would be the relationship of the locally owned power generating facilities to NYSEG? At what point in the electricity price curve can we justify bonds or other indebtedness based on projected future savings? Local natural gas. Tompkins County is reported to have small but meaningful deposits of natural gas. How much is there and where? How can we make sure that what we’ve got stays in the County to meet local needs? What changes need to be made in the agreements that the County is now entering into with the energy companies to prepare for probable future shortages? We need to ensure that our water supply is secure, both potable and household water and water for agricultural use. Our need to pump much of our water up hill makes us vulnerable, and so does our need for irrigation during drought years. The increased cost of pumping could become an additional burden on already overburdened farmers, and if electricity brownouts occur, they will cut off the water supply to hilltop residents. In conventional disaster scenarios, potable water is almost always scarce. It seems unlikely that rising energy costs would have this effect, but we should also take a look at our water purification and sewage treatment processes to identify points of vulnerability in that area. As noted previously, global climate change will have an effect on our water supply. The regional prediction is for a wetter climate overall, but with periods of drought and an increase in extreme weather events. The temperature is likely to change less in the Northeast than in other parts of the world, but the ocean currents are a wild card, so the uncertainty is greater. If summers here are drier, as several studies have predicted, then some (as yet unknown but significant) amount of irrigation will be needed to sustain some crops that currently depend on reliable rainfall during the growing season. Households will need to store rain water again for gardening. Forests are known to buffer and stabilize the local climate. Our extensive woodlands are an asset that we should carefully protect not only for animal habitat and biomass production but also for protection against the extremes of climate change. Water and energy. What inputs of energy and chemicals are needed for conventional water purification and sewage treatment? What are the fossil fuel dependencies for those inputs? What alternatives are available? Can any of these alternatives be produced locally? How does the cost of maintaining the existing system with alternative materials compare with conversion to smaller-scale water systems such as rainwater catchment systems (see below)? Infrastructure. What is the age and life expectancy of the current water delivery system? What are the expected maintenance requirements and fossil fuel dependencies of repair and replacement materials? Well water. A hundred years ago, residents of Tompkins County obtained their water from hand-dug wells. Can we reclaim that ability? How was water procured and distributed to city dwellers? How did residents outside the city access clean water when their wells went dry? What water-borne diseases afflicted the county then? What low-tech sustainable practices exist for finding, pumping, filtering, and treating water? Can these be done by average households in the county? What materials and skills are needed? Do we have them in the county? Rain water. Like most of central New York, the county is blessed with abundant precipitation, but climate change will require water received during wetter months to be saved for use during the drier summers. Rain barrels were a common sight a century ago; how did they work? What did people feel safe using that water for? Can the rain water catchment systems widely used in Africa and Asia be adapted to our climate? How are such systems modified to collect snow melt as well as rain water? What materials and techniques will be easiest and most economical to use here? What building codes and zoning practices will have to be modified to enable effective household collection and use of rain water? Greywater. Are systems to collect greywater (for example, waste water from washing machines) more economical to build and maintain than systems to collect rain water? What building codes and zoning practices would have to be modified to enable effective household collection and use of greywater? Irrigation. Historically, New York state agriculture was not based on irrigation (at the turn of the last century, the state had a grand total of 68 acres under irrigation out of a total farm acreage of more than 22 million). What is the county's current dependence on irrigation for agriculture? To what extent will this be affected by a rise in the price of energy needed for pumping? To what extent will projected drier summers due to climate change increase the need for irrigation? Underground sources. A USGS study nearing completion in Dryden has found multiple layers of aquifers, an unexpectedly productive (1000 gal/min) well near Dryden Lake, and possible fossil water. Freeville is known to have artesian wells. What sources of water are available around the county, especially for higher elevations? How permanent are those sources? (Some springs dry up regularly, while Cayuga Lake is relatively stable.) How much water can be drawn from these sources sustainably? Medical uses. What are the county's requirements for medicinal sterile water? What low-tech procurement, treatment and storage procedures exist to support this need? Health-related issues. What are the signs/symptoms and recommended treatments for people suffering from water-borne diseases? Do we have the materials and skills needed to treat water contamination (bacterial, viral, chemical) within our local community? What lessons can be drawn from the 1903 typhoid epidemic in Ithaca? How do different sources of water (surface, wells) differ in their safety relative to energy input (for purification or pumping) costs? Developed immunity. Many people live in areas of the world where bacteria are present in the water and are not bothered by it, because their bodies have adapted to that particular environment. Can our bodies adjust to the presence of water contaminated with certain kinds of bacteria common to Tompkins County? Do children and infants have special needs in this area? Storage. What large-scale water storage facilities are practical in this environment? At the household level, what water storage practices are safe for drinking water? How long will water keep? In what sort of containers? Allocation. How do the efficiencies of shared water systems change as energy costs increase? What models are there for water sharing/partnering between rural and urban populations? What incentives for sharing can be constructed? What would a water rationing program look like? Our present system of waste disposal, in which we make it go away by putting it on a truck, is quite fuel-intensive. Fortunately, our diminishing consumption will leave us needing to deal with a lot less waste, but we will still be left, as we always have been, with an irreducable minimum that must be disposed of for health reasons. Bodily waste, for example, will very quickly create a serious problem if not dealt with properly. Our current method of mixing body wastes with large amounts of water and then trying to figure out how to purify the water is not a sustainable use of energy. Infrastructure. What is the age and life expectancy of the current sewer and septic systems? What are the expected maintenance requirements and fossil fuel dependencies of repair and replacement materials? City sewers. How much energy does it take to run the City of Ithaca’s sewage and treatment system? Is there any way to reduce that cost? Can sewage treatment be reconfigured to yield organic manures for local farming? Septic systems. Many people in Tompkins County depend on septic systems that need occasional cleaning. Will high costs of energy interfere with this function? If so, what can be done about it? Eco waste systems. Some experts believe that the way to approach sewage treatment is to stop using large amounts of water to process human waste and instead figure out ways to process it that yield fertilizer. This also solves a potentially very large long-term problem having to do with phosphorous depletion, while at the same time substantially reducing our use of water, which will become increasingly expensive. How much would such a system actually cost? Could it be deployed on a mass basis? How bad will things get before County residents could be convinced to use it? It may seem strange to list “soft” concerns among the difficult challenges listed above, but in fact our ability to cope with the coming changes will depend as much on our social and personal resources as on our material resources. The notion of “community” has fortunately not been as completely lost in Tompkins County as it has in many other parts of the country, but certainly the institutions that once bound us together at the local level have sustained some serious damage from the automobile culture. Much of the former community solidarity of this area was based on religion — as evidenced by the way in which our smaller communities still define their activities in relation to the local churches — and it’s difficult to imagine rebuilding this form of community organization given the diverse and more secular orientation of our current population. Other ways must be found to rebuild communities into the mutual support systems we will need in the future. On a personal level, many of us are going to be strongly affected by the lack of mobility that will result from the permanently high price of oil. While we tend to joke about the “cabin fever” that afflicts many residents during the winter, most of us recognize the effect of confinement as a potentially serious psychological risk. But cabin fever is nothing compared to what many people will feel when deprived of the unlimited ability to travel by automobile any time, anywhere, whether this limitation comes directly from high prices or indirectly from unemployment. Dysfunctional families whose only outlet is the ability of their members to get out of the house will suffer severe stress when confined in one place for long periods of time. People who identify with their vehicles and act out their need for control through the control of their vehicles will experience serious crises of identity, as will unemployed “movers and shakers” whose concept of self is bound up with their role in larger enterprises. Many people will refuse to acknowledge the underlying cause of the problem — their own overconsumption of a finite resource — and will instead project their anger and frustration onto a variety of scapegoats, ranging from oil companies (for profiting from high prices) to environmentalists (for impeding the construction of power plants) to mysterious cabals (for being mysterious). People’s unwillingness to face their own complicity in creating the problem will be abetted by politicians eager to profit from popular unrest and looking to deflect attention from the sizable contribution made by their own failure to address a problem that has been decades in coming. Rebuilding community. How do we foster the recreation of strong local communities in the absence of a common religion? What kind of rituals can replace the practices that formerly bound neighbors into a common cycle of activities? Rebuilding self. How can we provide alternatives to the sense of personal freedom and control previously made possible by cheap fuel? Is it possible to build a network of local gathering places that will allow people (especially young people) to escape from the house without needing to travel far? How can we replace the psychological and social functions of the automobile? Rebuilding purpose. How can we give people whose identity is bound up with their jobs an alternative sense of purpose when those jobs have been made obsolete? Can the need to grow one’s own food serve this function? Rebuilding personal empowerment. How can we restore a sense of personal control in a world that takes away our current almost unlimited ability to expend cheap energy? Replacing consumption. With what can we replace material consumption as an expression of personal identity and power? Combatting boredom. What will people do when limited to their own resources for entertainment? How can our extensive local arts resources help in training people to be more self-sufficient in this regard? Combatting denial. How can we move our population to accept responsibility for their substantially lowered standard of living and focus on appropriate adaptations to the new order? The preceding plan outline and list of research tasks address only the relatively short-term future, from a possible beginning of the decline of oil production in 2007-2010 to perhaps 2020. This is the future that seems clearest and that can be addressed in the window of analysis provided by the Hirsch study and others. It is a future of rising oil prices, rising transportation prices, and the economic disruption arising from a steep decline in our collective net worth as our enormous debts are called in by a world as hungry for oil as we are. At 15-20 years out from now, however, expert predictions diverge. 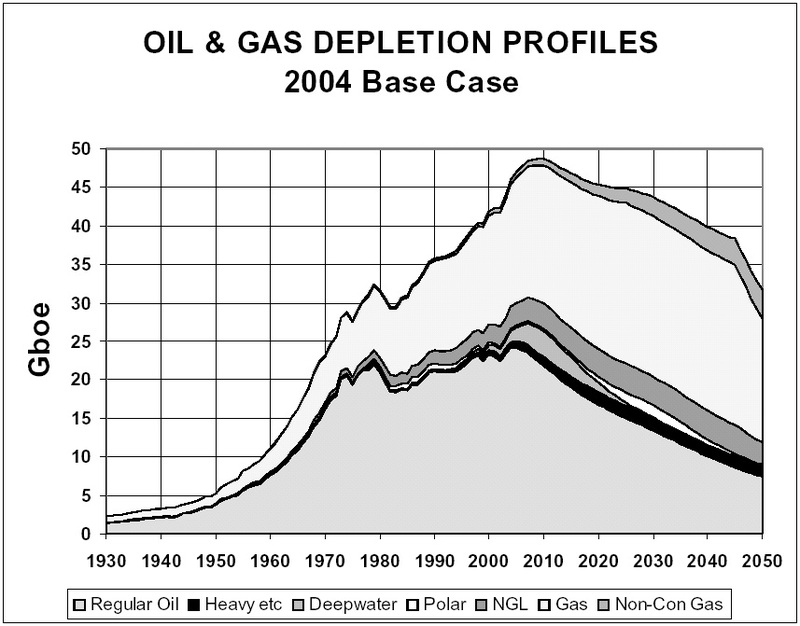 One school of thought, exemplified in the Hirsch report and by initiatives such as the Rocky Mountain Institute, predicts that economic pain will cause a massive revision of our energy infrastructure along with crash programs to increase fuel efficiency and exploit alternative sources of liquid fuel (LNG, coal, biodiesel). Together, these massive efforts will eventually bring us out of a painful short-term future into a cleaner, sustainable long-term future marked by permanently decreased consumption and maximum exploitation of energy sources other than petroleum. Other analysts, however, believe that we will simply not have enough fossil fuel left by the time the projected crash programs begin to build the infrastructure that can make these alternative sources produce anything like what we’ve come to expect, or indeed anything that will begin to support industrial civilization as we know it. Some analysts fear that we have already reached this point. Beyond all the early problems associated with rising energy prices lie the more direct and painful disasters awaiting the systems that provide us with food and water. The impact on agriculture of the rising costs of oil and natural gas was cited in the short-term relocalization outline as the partial cause of an increase in food prices. In the long term, however, oil and gas cease to be available as commodities whose price is determined entirely by market forces, and they effectively become unavailable at any price. Natural gas, in particular, has a tendency to occur in deposits that (unlike oil deposits) simply run out almost all at once. As noted earlier, natural gas has been in decline in the U.S. since 1973, and some analysts are forecasting a steep dropoff in U.S. natural gas production beginning around 2020. Aside from the very severe effect it will have on our ability to heat and to generate electricity, a worldwide decline in the availability of natural gas in conjunction with the likely very high price of oil will return world agriculture to roughly the condition it was in a hundred years ago, with almost the entire population living on the land, depending on draft animals for power and nothing but manure and nitrogen-fixing plants for fertilizer. Perhaps the closest familiar example of this style of life is the modern-day Amish. This is not such a bad life, and those of us who end up there may have reason to be grateful. But if the fossil fuel depletion is inevitable, we will have to live with a consciousness of mass starvation all around us. This problem is best understood in terms of the so-called “green revolution.” Over the course of roughly a century, the green revolution enormously increased the short-term output of our best land by developing cultivars and practices that maximized the conversion into nutritional biomass of the carbon in the soil and continuously supplied fossil fuel inputs (including the ammonia fertilizers made from natural gas). The resulting increase in production raised the world’s carrying capacity from about 1.5 billion to over 6.5 billion. If the fossil fuel inputs that created the green revolution decline, the carrying capacity of the world will decline accordingly. The difference between the population the world has and the population it can support will be accounted for by famine and disease. The worldwide water situation is equally ominous. Large populations in Asia are already facing life-threatening water shortages in the immediate future, in some cases caused by the pumping out of irreplaceable ancient aquifers using engines powered by cheap fuel. Here in the U.S., we face droughts caused by climate change in much of the central plains and the southwest. While average rainfall is projected to remain reasonably plentiful in the northeast, most of the water we get from the tap here in Tompkins County has to be pumped — and that requires an extensive input of energy. As the cost of energy goes up, so will the cost of water, and eventually the only well water we get may have to come from pumps powered by solar arrays. For us in Tompkins County as in the rest of the country, the long-term future will depend on which set of analysts are correct — the ones who predict an ascetic but still recognizably industrial future after a period of great economic pain and disruption, or the more pessimistic ones who can’t make the estimated amount of energy we have left accomplish the large-scale replacement of our energy infrastructure under any set of economic assumptions. Regardless of which predictions prove correct, it is not difficult to define the optimum public policy strategy, which is to continue the programs outlined in the short-term relocalization plan together with some fairly obvious additions to the plan in case we find ourselves dealing with the more pessimistic predictions. The additions that suggest themselves for the worst case are, first, a switch back from fossil-fuel driven transportation and tillage to motive energy provided by horses, or perhaps (as recently in Cuba) with oxen, which do not compete with humans for grain; second, the construction of rainwater catchment systems for most households; third, maximum exploitation of alternative energy sources available to us, including solar, wind power, and microhydro power; fourth, maintenance of priority remnants of the former infrastructure, in particular local networks (roads, electricity, communications) and health facilities; fifth, the redevelopment of our ability to entertain ourselves; and finally, a mass relocation of urban populations to the countryside together with a mass redistribution of land to provide everyone with a self-sustaining homestead. The social implications of these actions are obviously enormous. Hopefully the reduction in consumption and change in lifestyles brought about by high oil and transportation prices over the next fifteen years or so will extend the time available in which to solve these longer-term challenges. Whether the County needs to develop relocalization plans for the longer term should become clear well before the end of the time period addressed by the short-term relocalization plan. For right now, send mail directly to the editor: bosak@ibiblio.org. Copyright © 2005 Tompkins County Relocalization Project. Use of this document is licensed under the terms of the Creative Commons Attribution-NonCommercial-ShareAlike license version 2.5. An overview of the Creative Commons license can be found at http://creativecommons.org/licenses/by-nc-sa/2.5/.